Walt Disney World Event – Be Inspired! …and Get ArtQuenched! June 22: If you are a fan of the limited edition Ink & Paint cels, then be sure to check this piece out. 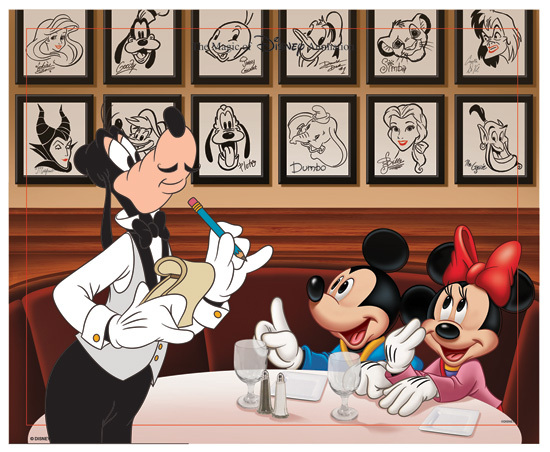 Hollywood & Dine is set to release on June 22 at Animation Gallery at Disney’s Hollywood Studios and features Mickey and Minnie Mouse as they enjoy a star-filled evening at Hollywood Brown Derby, accompanied by an exquisitely hand-painted Goofy, who is sure to serve up only the best. Hollywood & Dine will be available in a variety of formats. If you are unable to attend, don’t worry, Disney Events is taking pre-orders now through June 21. Call 407-827-7600. For those of you in the area, several of the Ink & Paint artists associated with this piece will be on hand for a special appearance and signing June 22 from 10 a.m.–1 p.m. and 2–5 p.m. at Animation Gallery in Disney’s Hollywood Studios. Learn more here. June 27–July 3: Art of Disney in the Downtown Disney Marketplace is pleased to welcome David Doss, who will be on hand to showcase some of his most recent releases. Learn more here. June 28–July 7: Precious Moments doll maker Linda Rick will be on hand for special appearances at Uptown Jewelers in Magic Kingdom Park as we celebrate the release of her new collection. Learn more here. Have you already attended Star Wars Weekends at Disney Hollywood Studios? Or have you signed up for the 13 Reflections of Evil Trading Event? If not, there’s still time. Don’t miss out! Look for details on all of these events and more on www.ArtofDisneyParks.com.